Wheaties may be the breakfast of champions, but cereal is no longer the champion of breakfast. Though cold cereal is still the most popular breakfast item, sales are on a downward trend. U.S. cereal sales fell about 2% last year, according to Neilsen Analytics. Meanwhile sales of less traditional breakfast food is growing. American's aren't eating less in the morning, they're just eating different foods. Breakfast sandwiches, Greek yogurt, and snack bars are what consumers are increasingly starting their day with. "I've been in this business a long time and it's changing faster than I've ever seen," General Mills (GIS) CEO Ken Powell told CNNMoney. Cereal, the company's biggest business, declined 3% in 2015. "Consumer values are changing, driven largely by the Millennial generation who just think more about food." One thing on their minds: healthy choices. Take milk, for example, which is often paired with cereal. In general, milk sales are flagging. But milk substitutes like almond or soy milk are growing by leaps and bounds. And while overall cereal sales declined, the healthier granola variety spiked 16%. "The decline of cereal is driven by a number of factors, including the shifting perception of what 'healthy' means," said James Russo, SVP of Global Consumer Insights at Neilsen. "There's an increased consumer demand for healthier ingredients in our foods." And when consumers want healthier ingredients, some cereals just don't make the cut. So breakfast giants like Kellogg's and General Mills are stripping out sugar and replacing artificial ingredients. 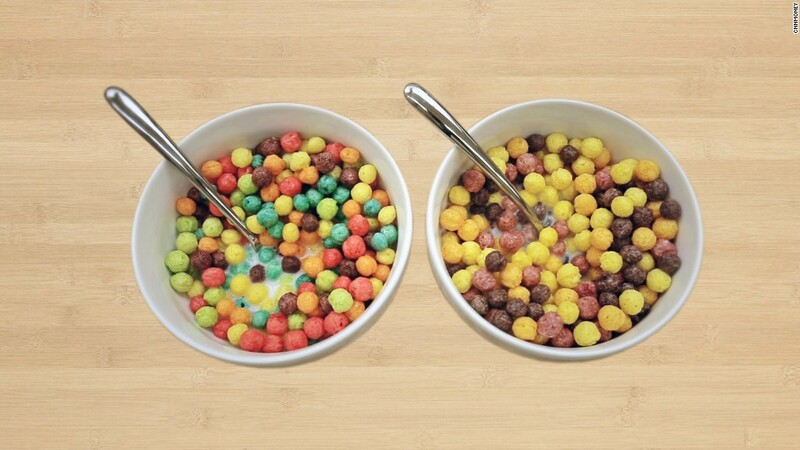 Even that iconic bowl of Trix is getting a makeover, as artificial colors are substituted for natural ones. "It's a huge initiative, probably the biggest initiative we've undertaken in cereal at General Mills, and we've been around a long time," said Jim Murphy, president of cereal at General Mills. The company announced last year it would remove artificial colors and flavors from all its cereals. "I think it's a trend that is big enough that consumers are looking for this type of a recipe in their cereals now. We think it's going to be a fundamental reinvention of cereal." It may have to be, if the business wants to survive. If that initiative fails, cereal can always get another reinvention -- this time, as a snack. Which can already be seen in some General Mills commercials that feature adults eating kid-centric cereals like Cinnamon Toast Crunch. "Cereal is certainly a breakfast item but our research would suggest that up to 30% of cereal consumption happens after breakfast," Murphy said. "For adults, and even kids, but certainly for adults, we know that consumption after dinner and later at night is very high. We're just starting to reflect it in our advertising."